Central Ohio experiences its share of hot, muggy summers, and air conditioning in Columbus is more a “need it” than a “want it” proposition. In that kind of atmosphere, it can be easy to ignore little maintenance issues that crop up. As long as the air is cool and comfortable, does it really matter whether the AC can use a little tune-up? In point of fact, it does, particularly when it comes to refrigerant. The implications of a low refrigerant charge on your air conditioning system can far exceed the minimal cost required to address it in a timely manner. Refrigerant is essential to the cooling process: as it changes from a liquid to a gaseous state it cools the air in your home. It needs to arrive at the evaporator coils in specific levels in order for the process to work as it should. When those levels run low – usually because a leak has sprung up in the system – then the process encounters problems. Too little refrigerant means too little pressure, which means your evaporator coils will get too cold and the condensate on them can freeze. Ice starts to build up on the coils, affecting the unit’s ability to cool the air and forcing it to work harder to achieve the correct temperatures in your home. That translates to higher electrical bills, as well as increased wear and tear on the unit. In the worst cases, the ice can stop your AC from cooling entirely. A low refrigerant charge also demonstrates why it’s preferable to call in at trained expert to treat it. You can’t simply remove the ice build-up from the coil and expect the problem to be solved. You need to track down the leak itself and seal it before recharging the unit with the precise refrigerant amounts required by the AC’s make and model. A trained expert can perform such an operation quickly and efficiently, and make sure the unit is functioning as it should before he finishes. 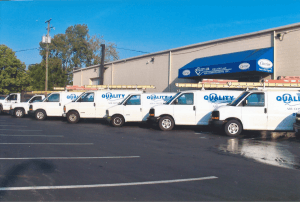 For any issues with your air conditioning in Columbus, call on Quality Air Heating and Air Conditioning to provide an answer. Our dedicated team of experts can get on the problem whether it be low refrigerant charge or the installation of an entirely new unit. Contact us today and see what a difference the right people can make.